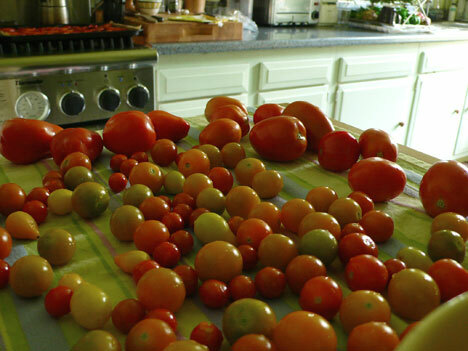 i can’t believe that just on sunday, i had all the windows open while i worked in the kitchen, getting the latest batch of produce squared away. just two days later, i’m huddled here at my desk wrapped in a sweater, as high winds blow cold rain and the temperatures continue to drop. my prediction that we have three more weeks before the frost may have been hasty. the garden actually seems to have come to an abrupt halt—where i was collecting a basket-full of stuff every day or two, suddenly there are just a handful of things for several days now (except the greens, which love this weather). it was a little challenging to get started on another wheel after working for so long on the schacht. the two wheels are set up differently from each other; the schacht has all its mechanisms in one compact space so that working between the parts doesn’t really require dropping the fiber. 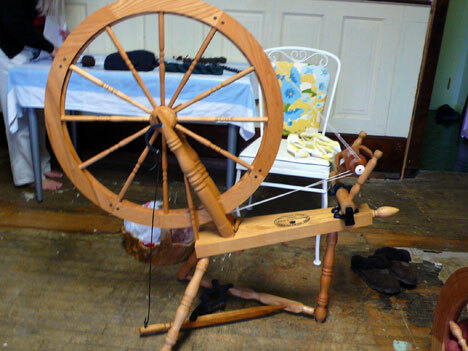 it’s also a double treadle so getting and keeping the wheel going is effortless. and it’s easy to adjust the tension, even in double-drive mode and i’ve grown accustomed to the playing with that a lot; it has spoiled me. the parts of the merlin are further apart, and it requires a little more coaxing to get the bigger, heavier wheel going (this smooths out once you get used to it, but at first, it’s kind-of a pain). 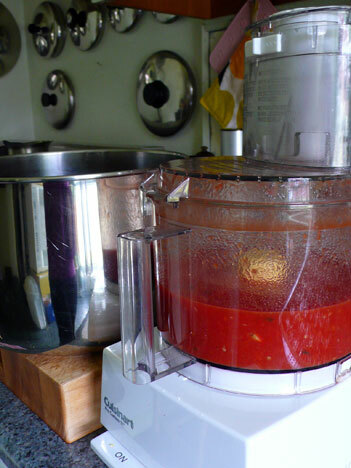 it’s also a little trickier to get the tension just so, with the right amount of takeup. i fiddled with that until i wanted to tear my hair out, but eventually i found my zone. and once it’s there, it does not require constant as much adjusting. 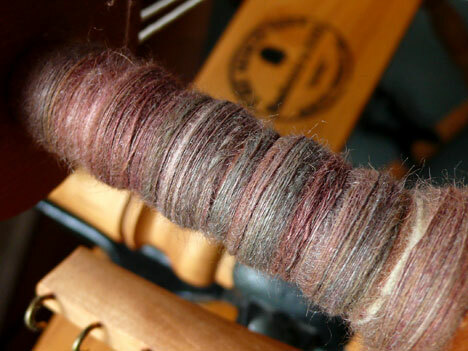 by the time the other spinners arrived, i had everything pretty well in hand, though i hadn’t gotten much fiber spun, heh. but by the end of class, i was spinning pretty consistently on it and i’m looking forward to mastering this wheel further. i chose a beautiful blend of baby camel and silk from a verb for keeping warm in colorway taboo, a mix or red, camel, tan, and some gray/blue that has nice depth. this fiber is blended a little differently than the cashmere/silk i just finished working with—the two fibers are not blended to the point of homogeneous consistency, so that veins of pure silk or pure camel run throughout. it takes a little getting used to, because the two fibers have completely different staple lengths, but i’m excited about seeing the results in the yarn. i’m expecting that maybe i’ll see irregular flashes of silk against the matte camel fiber, though this would show up more if i was spinning a heavier weight yarn. i can’t wait to find out . . .
everyone else is still spinning the same projects as last time, but they all brought new knitting projects to share for a few minutes before we got the wheels going. 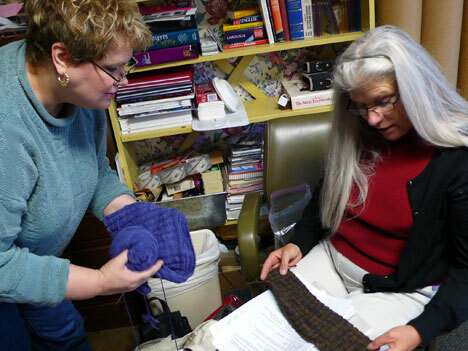 anne marie and barb are neck-and-neck on the progress of their maze sweaters. 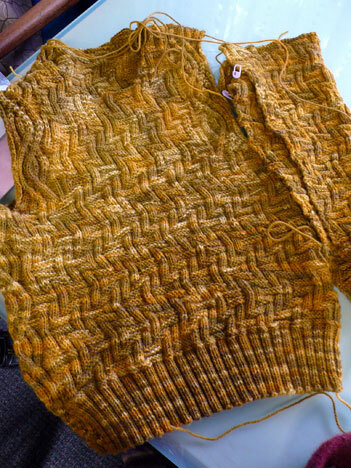 anne marie is knitting hers in the same briar rose legend i used, a beautiful mix of golds. linda is using knitting notions classic merino sport in the dusk colorway, which constantly changes, depending on the light it’s in. i know because it’s the same color i have in the superwash sport and it’s a challenge to photograph it accurately. so we had a great show-and-tell. then we spun for the rest of the morning, which was even better. i almost gave up on using the big wheel, but decided to stick with i. and that’s when things began improving—funny how that can happen. after everyone left, i headed straight for the kitchen. i had a big pile of just about every kind of vegetable to deal with and there was no putting it off. with luck, i thought, i’ll be outta here and knitting in a few hours. heh. well, it went a little over that—i cooked til almost 7 pm, but i listened to a good book while i worked and got a lot done. 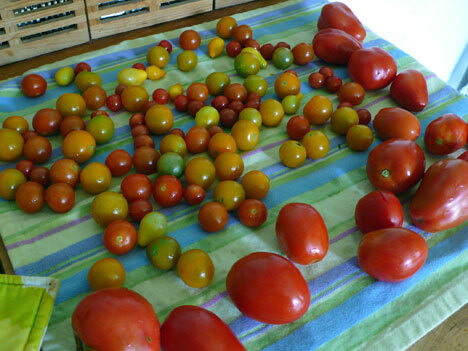 i collected all the ripe tomatoes from the porch and from the previous day’s picking. i’d been pondering what the heck to do with these for several days sincei don’t need to freeze any more. i decided to make a big pot each of soup and sauce. 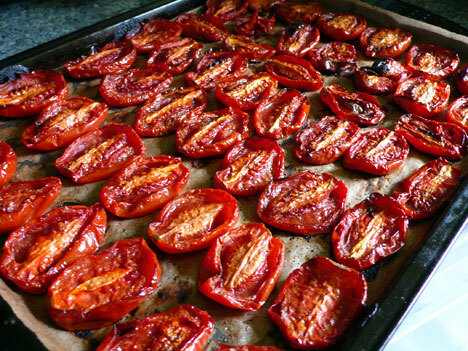 i dry-roasted half the tomatoes to puree for paste—with some garlic hidden underneath to save out for the saucepot. i saved some of each to make pasta e fagioli, which was david’s choice of soup for this week, and cooked enough sauce separately for a few meals. for the soup, i started a sauté of the usual onion/carrot/celery mix, but added some summer squash, because what else am i gonna do with it? my grandma would spin in her grave if she knew i added little chunks of zucchini to the pasta e fagioli, but i can’t imagine that varying the recipe is worse than wasting food. (i did ask david’s opinion on the squash first—i’m not sure he really cared, but he wisely took a sec and then nodded slowly as if he really put some thought into it). actually, it was good that way, too. but i still won’t say a word to my mom about it. i opted to deal with the peppers another day; they got washed and put in the fridge—i think i’ll stuff those some night this week to freeze for christmas eve dinner. as you can see in the photo above, our apple harvest doubled this year. while i was outside sunday morning i decided to snag these two apples from the tree before some other animal got them. i took a break during the afternoon to share the bigger one with david and it was surprisingly delicious (last year’s apple was just awful). hmmm, it might be worth exploring how we can get more out of that tree, which we’ve always considered useless for making actual fruit. this apple was crunchy, sweet and delightful; i wouldn’t mind having a few more . . . but we know nothing about how to care for fruit trees. to end the afternoon, i cooked a head of cauliflower that david bought earlier in the week into a simple pasta dish with anchovies and hot pepper, which is quick and a favorite comfort food of mine. 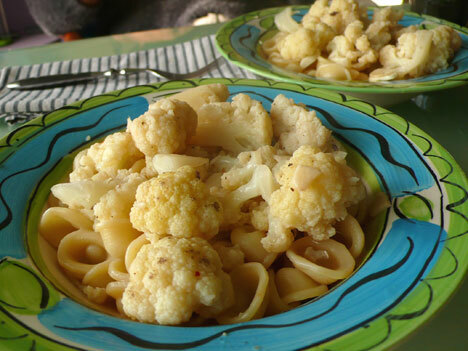 it’s one of those all-white dishes that’s hard present attractively, though it tastes yummy. it felt great to sit down. after dinner i worked on some photo-editing, until very late. i was stubbornly intent on getting some knitting time in before bed, so at 2:30 am i finally joined david to watch TV and work on my green sweater. i love this sweater in green. 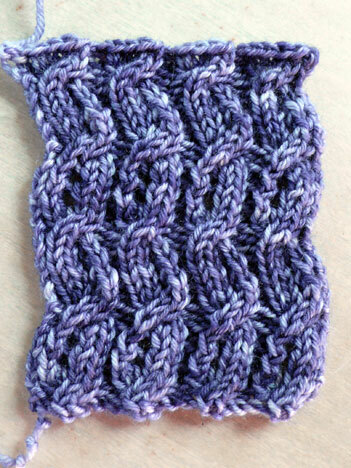 yesterday i sent a swatch off to moving mud so they could make some little glass buttons to sew down the front of it. i’m looking at the little flat, seed-shaped ones and admiring those that have some turquoise and yellow mixed in—i especially like the center one in the top row. a little bit of contrasting color would keep the sweater fresh-looking, i think. i’m almost done with my first front. i took a whole week to knit this piece; i’m kinda proud of not becoming obsessed with it yet not giving in to my obsession with it at the expense other knitting. hahaha, one small step at a time, one giant step for anne, right? 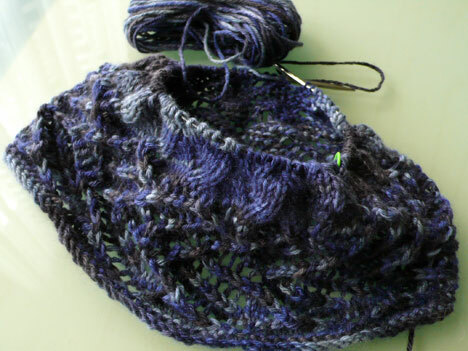 yesterday in class, i cast on for a second cashmere neckwarmer, just to make sure i had my pattern right, and to knit through a couple of tricky areas to see what i could do about writing them more clearly. 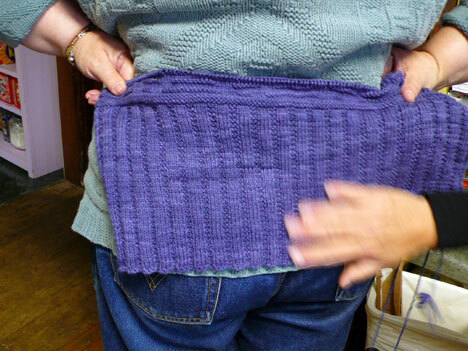 the pattern is all written up and proofed; a couple of test knitters are taking a go at it now. we should be ready to release it next week. 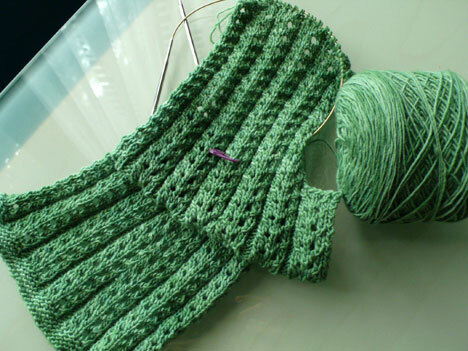 i’m almost done knitting this second one—it’s sort-of a race to see which ends first, the yarn or the pattern. according to my postal scale, i should have had nearly-equal weight and yardage for each one. but it’s possible that the first one took a few more yards than i estimated . . . we’ll see. i have at least as much more stuff to show you as i’ve already talked about, so i’m saving the second half for tomorrow. 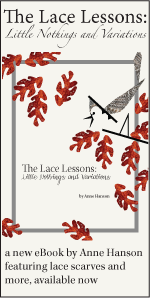 there’s more knitting, more class stuff, and books. see you then . . .
i haven’t used moving mud yet, but i’d definitely like to one of these days — and i spent some time ogling that very button when i first discovered them a year or so ago! something like that would go great with this cardigan. 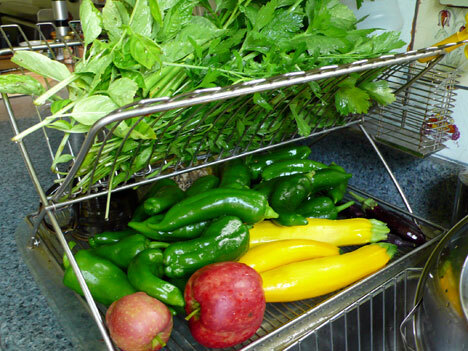 Your vegetable bounty never ceases to amaze! Love the examples of the Ondule sweater. I’m thinking about using my new orange Legend for it but haven’t swatched yet. Do you think that would work? Love that button in the top row. I love the sweater too. With the wonderful pictures of food and talk about dinner you could add a separate section to the online shop for receipes. Oh those buttons are so cute. There are some orange buttons on the round page that look like they’d be perfect with my sweater in progress. 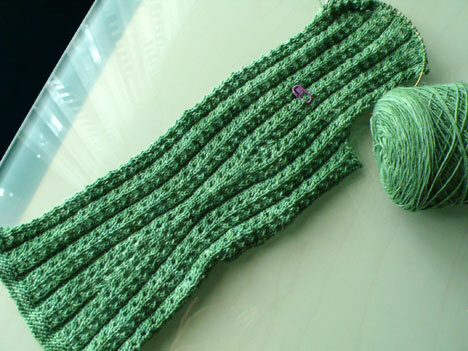 But unfortunately I need something like 11 buttons, and they could end up costing the same amount as the yarn. Maybe I’ll save the idea for a 5-button project instead…lol. Seeing your basil reminds me that I have enough on the plants to make a nice batch of walnut pesto. I’ll have to get to that before we get a frost! I had a spinning disaster Sunday..I tried to ply some yarn off of hand spindles after a LONG day and I guess my patience was gone and I wrecked a batch of yarn. I think it’s a tension issue…but I haven’t figured it out yet. 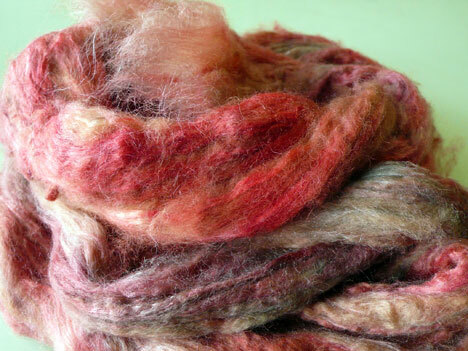 After seeing your 550 yds (I think) of your last spun yarn I decided to try and get back to spinning more fine yarn. I am enjoying it but I know I am going to have to get back on the “wheel” and figure it all out. and your maters look so inviting! I made some earlier this summer. It’s good to know I’m not the only one who picked Ondule for a “first sweater.” Now I just need to actually start knitting it! As for the tree, I asked my dad the apple scientist, and he has much advice–I’ll email it along! So refreshing to read you once I have come home from a busy, sometimes rough day. 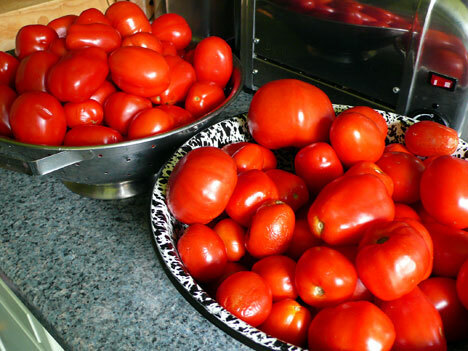 Thank you for the pictures of ruby tomatoes and the little moments of Zen. I don’t know which is more drool-worthy, the gorgeous knitting or the gorgeous vegetables! On the subject of cardigans, any advice on how to keep the buttons from pulling? I sewed them on with shanks but they still pull. I’m pondering grosgrain ribbon facing, but it scares me. Many states have County Extension Services from the agriculture departments of their state universities. (I know Iowa, Michigan, and Louisiana do, for instance.) Were I trying to learn about growing fruit trees where I lived, I’d consult them…on-line, free pamphlets from the extension service, or often they leave their pamphlets at nurseries. Good apples are a wonderful thing – good luck! I really am partial to that green sweater. It’s going beautifully. And I’ve marked that link for the buttons too. Where do you get all the energy and focus to get through work as fast as you do? Your whole entry is delicious! What about a nice ratatouille with all your good veggies? I’m loving the green sweater, it looks like a nice relaxing knit! however do you do it! Everything looks amazing on your blog – from the knits to the eats! Love the picture of the dried tomatoes. I have cauliflower on my grocery list for today. Am going to try a new dish. Love cauliflower!!! What is with these Ohio temps?? I NEVER turned my heat on in Virginia in September! That soup sounds real good, very tasty. Sniff, wish I live closer. 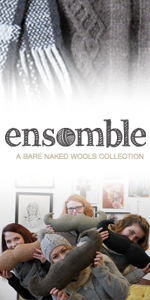 Your knitting and spinning community sound wonderful. Amazing photos. 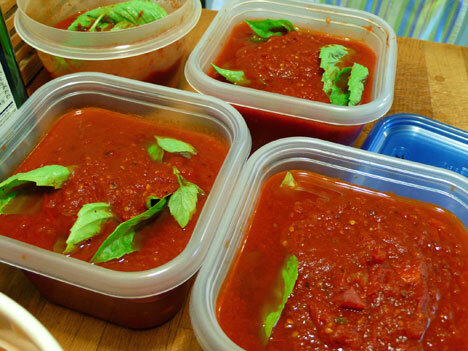 The soup looks so yummy & such a great way to use up all the tomatoes. Such a bountiful post 🙂 What’s the name of the calendar you used for planting the garden this year? I’d like to have a closer look for next year.